Text in it’s digital form or as a product of a digital process prior to printing is what we mainly encounter today. However we don’t have to travel very far back in time to find a different reality. Tracing the development of digitization of text the invention of text recognition software, also known as OCR (optical character recognition), might be said to have played a key role in the transition period to the above mentioned development. 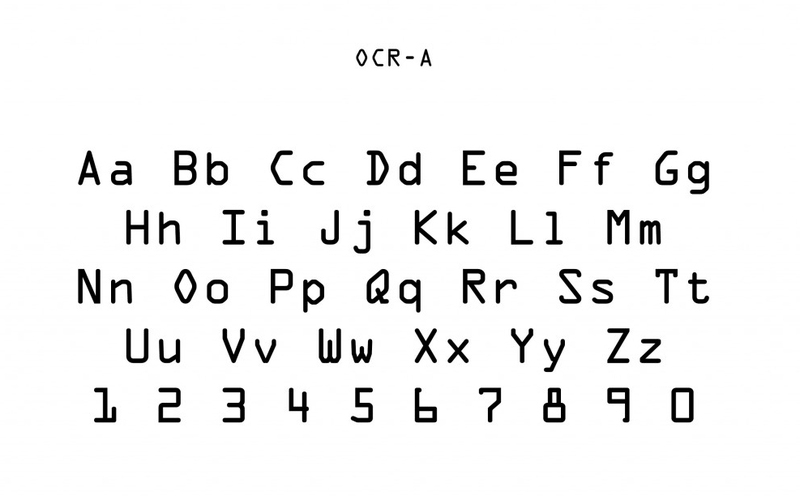 Commissioned in 1968 by the American National Standards Institute the font OCR-A was released, as a international standard for a font easily read by humans and computer. Thus enabling printed matter to be translated into digital form without having to have a person manually type in the information once again. 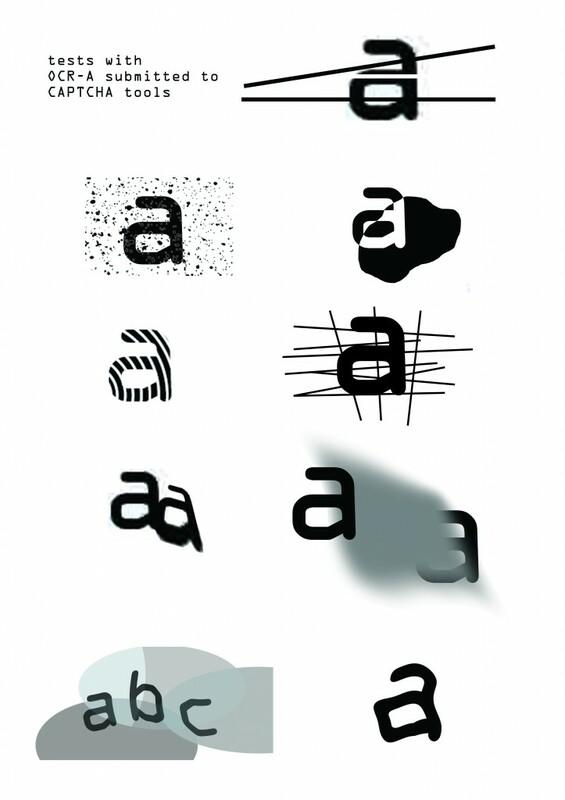 Due to the in today’s view limited ability of text recognition by computers, the outcome was a quite peculiar looking typeface. One could for example mention the very weird captital “o” among other odly shaped characters. But here the logic goes towards enabling the computer to fast and easy make the distinction between a capital “o” and a zero, without doing what we as humans of cause easily do – which understanding which is meant due to the context in which it’s presented. The general effect of the font is one that is not very easy or pleasurable to read for longer text pieces, in fact making it a font that is more suited for the needs of the computer than that of easy human readability. This I believe is an important point which I will return to later in the connection with CAPTCHA’s (an acronym for “Completely Automated Public Turing test to tell Computers and Humans Apart”). However taking a leap from 1968 to todays society, OCR-software are now able to recognize almost any text in no time, let alone the fact that a vast amount of information all ready exist in digital format and might very well never enter the physical world as printed matter. Being a child of the 90’s myself, my generation have been brought up in a time were the development of the computer and the internet and the digitization and accessibility of information that it brought along has truly underwent extraordinary progress. Text and images crossing the globe in split second enables us to pass the physical boundaries of time and space. But let’s stay grounded for a second. Cause as we surf around the internet so does computers. Bots with algorithms designed to sign up for free emails in the count of several thousands, to send out millions of so called “spam” e-mails turned out to be one of the problems that the internet encountered. The number of spam e-mails is estimated to be around 200 billions a day. As a tool to avoid this the “CAPTCHA” was invented. A small box with hard to read text from which the user is supposed to decipher the letters in order to enter a certain webpage. 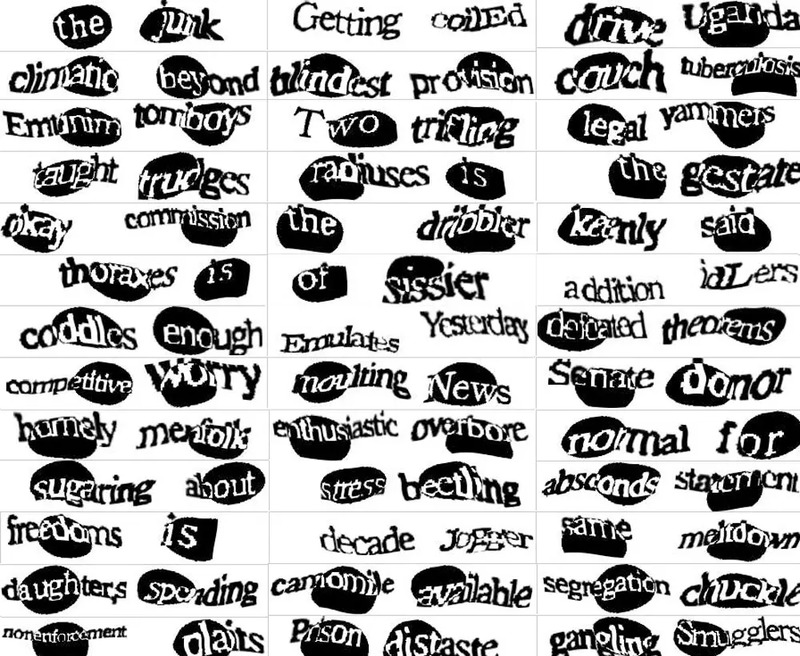 The aim is to simply create a text which a person but not a computer could decipher, thus telling the two apart. Going back to earlier mentioned OCR-A font I find it interesting to see how the CAPTCHA actually operates in the same intersection between human and computers, just here the goal seems to be the exact opposite in actually striving to avoid OCR-software to be applied. In my research i started looking into the various CAPTCHA’s and tried out whether one could mimic some of the visual tools applied by such software. Which got me thinking, if one could imagine a complete font mimicking the CAPTCHA? This example would of course only be a mere visualization of such a font, because of the nature of CAPTCHA’s an actual font would be ever changing in order to avoid OCR being applied upon it. Apart from my own visual affinity for this type of text, I also find there to be a sincere need for such a font or at least at a symbolic level of hindering information from being to easily accessed by computers. What I mean by this is that how much the last 20 years off development of the internet has truly amazingly achieved, I also believe that it has been engaged with a certain sense of nativity, which we are only now starting to realize, it seems. It was apparently perfectly natural for us to browse around the globe using free search engines or sign up for free e-mail services or to move through cities of the entire world in street level perspective. But what does these services cost if not money? The answer seems to be personal information. The reality being that our every move are potentially logged and can be utilized to profile us as consumers in order to sell advertisement space. But not only that, as relatively recent ‘leaks‘ by Edward Snowden showed us it’s not only corporate industry but also governmental agencies such as the NSA that are interested in our personal information. So what’s left to do- cutting our LAN-cables and WiFi connection while putting on the the tin foil hat? Neither seems very tempting. So what I’m advocating is not total paranoia but maybe once in a while remembering the saying: “there is no such thing as a free lunch”. 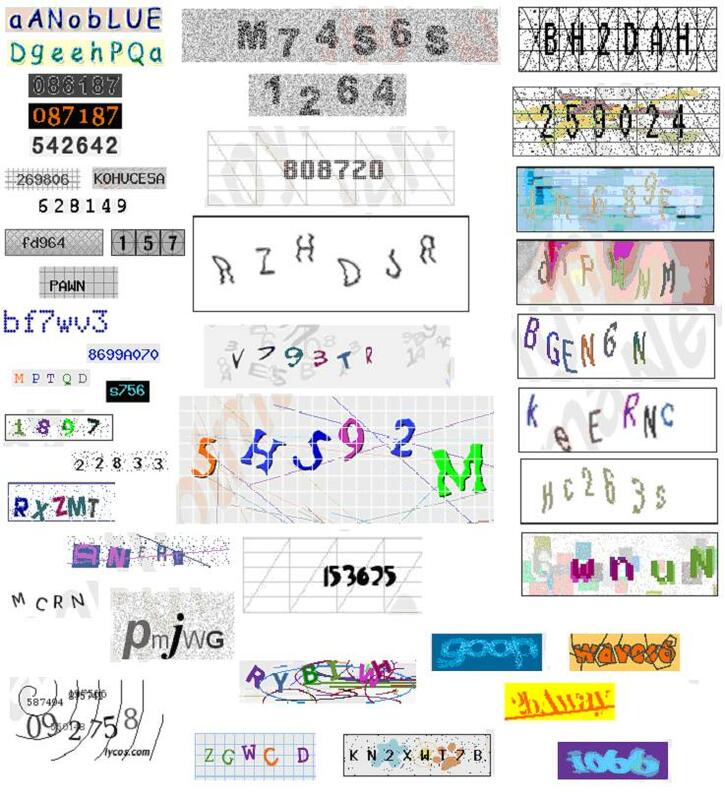 CAPTCHA as a typeface is indeed not very practically, but what I find potentially interesting is possible tools to provide us with a shelter for automated accessing of our personal information- also if only for a short while.